Poor old Quiche Lorraine. No, really – hear me out. Just imagine how it feels. 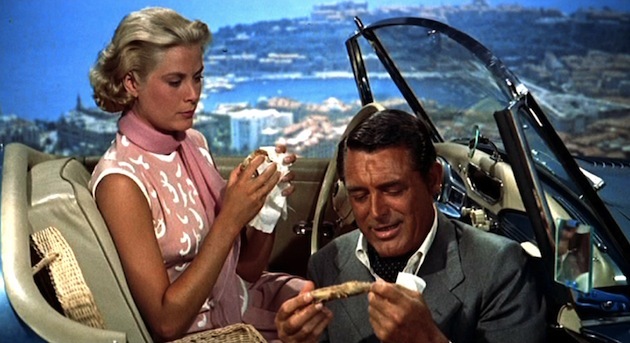 One minute you’re being introduced to the world as Cary Grant’s lunch of choice in To Catch A Thief (it’s the part where he’s in his swish villa talking to the straight-laced English insurance chap). 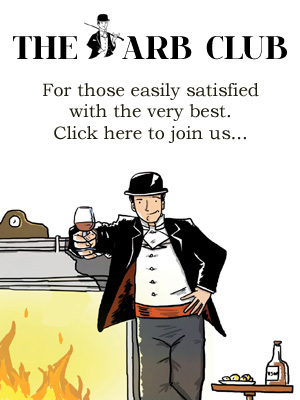 Surely the epitome of style and sophistication. But then it’s the 1980s and you’re a laughing stock. 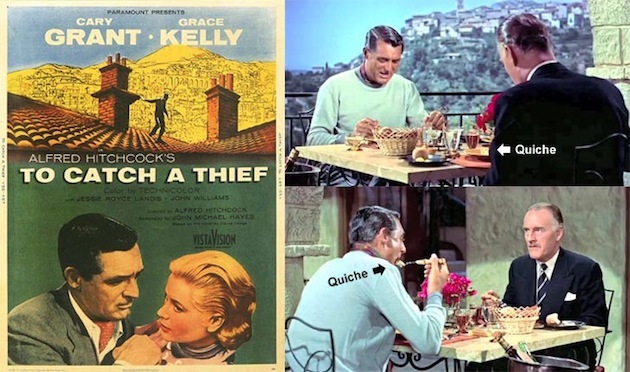 So ubiquitous through the mid-late 70s that there was a book called ‘Real Men Don’t Eat Quiche’ – which is frankly a bit rich and I can only imagine the author had never seen To Catch A Thief. The quiche has never really recovered. Too often now it is served with ironic inverted commas and a knowing smile. But the Quiche Lorraine deserves so much more respect than that. And mainly, it deserves to be cooked and eaten and enjoyed again. A true Lorraine is a pastry case filled with bacon, eggs and cream. That’s it. Nutmeg is allowed but put your onion or your mushrooms back in the pantry for they have no place here. With any other ingredients it’s a Quiche-Something-Else. This quiche is as light as air, melts in the mouth and is tasty – oh-so-tasty. Perfect for lunch on a summer’s day. It is best when fresh out of the oven, while it’s still warm and souffle-like. Bear that in mind when thinking about timings. The pastry case can be baked blind ahead of time and then for the quiche-proper I’d say allow 10 mins prep, 30 mins in the oven, 5 mins before serving. 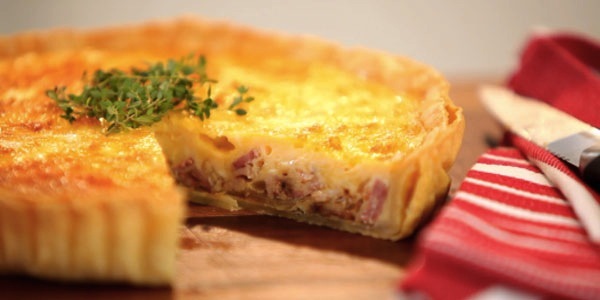 You’ll need a quiche or flan dish that’s approx 22cm diameter. Rub the butter into the flour with your fingers until it becomes like breadcrumbs.Add the egg and as you work that in you should start to feel it all come together. Slowly and gradually add 3-4tbsps cold water – just enough to create a dough. Knead lightly until its smooth. Shape it into a disc, wrap in clingfilm and let the pastry rest in the fridge for about an hour. Grease your quiche dish with butter. Roll out the pastry to about 4mm thick and ease it into the dish. Press it into the sides – use a spare bit of pastry to do that and there’s less risk of your fingers going through it. Let the pastry overhang the sides as it tends to shrink as it cooks. Prick the base all over with a fork and chill it again for 20 mins. Preheat the oven to 180C. Before it goes in the oven, stretch a large piece of baking parchment over the dish and fill it with rice or baking beans to weigh the pastry down. Put it into the oven for 20 minutes then take it out briefly to remove the rice/baking beans and the paper. It goes back into the over for another 5 mins to finish off the base. (If the pastry has had the temerity to bubble-up despite the weight you put on it, just prick those air bubbles with a fork.) You are aiming for pastry that is just starting to go a little golden. Now sit the pastry-ed dish on a wire rack to cool and trim the edges so that the pastry is flush with the dish’s lip. Really that is the time-consuming bit done. 1. Preheat the oven to 180C. Lightly whisk together the cream and eggs. Season and add some hearty gratings of nutmeg. 2. Get a dry frying pan nice and hot. Lay the bacon slices in it just until they start to sizzle and the fat runs. Now arrange the bacon in a layer on the pastry base. 3. Pour over the eggs and cream combo. Dot bits of butter over the top and now your Lorraine goes into the oven. The next 30 minutes is like one of those time-lapse sequences in a nature programme. Through the oven door you’ll be able to watch the Lorraine filling become gloriously golden and bouncy. It’s done when it’s set – test it by touching it. The 5 minutes before serving should be just about the right length of time to dress a salad and open the wine.